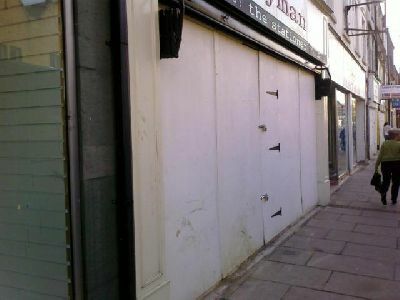 This is one of the many empty shops on Northbrook street in Newbury, Berkshire. It is partly down to a large re-development of the area where shops have been forced to close prior to demolition. It soon won’t be worth visiting the town with better and bigger shopping areas in Basingstoke and Reading. This is the start of the decline of Newbury town centre. a nice new, empty shopping centre won’t revive it!